Best wishes for the New Year to all my readers. I wish you all the success and happiness in the universe. May this year bring awareness to important issues in this world and let’s make it a better place, by individually changing to help and guide humanity. Now, above we have a statement by Richard Dawkins. He is a respected Atheist. I am going to be fair because I am going to look at both sides of the argument. I can understand where Dawkins is coming from. With the theory of evolution, scientists are proving and have proved that the universe is expanding. 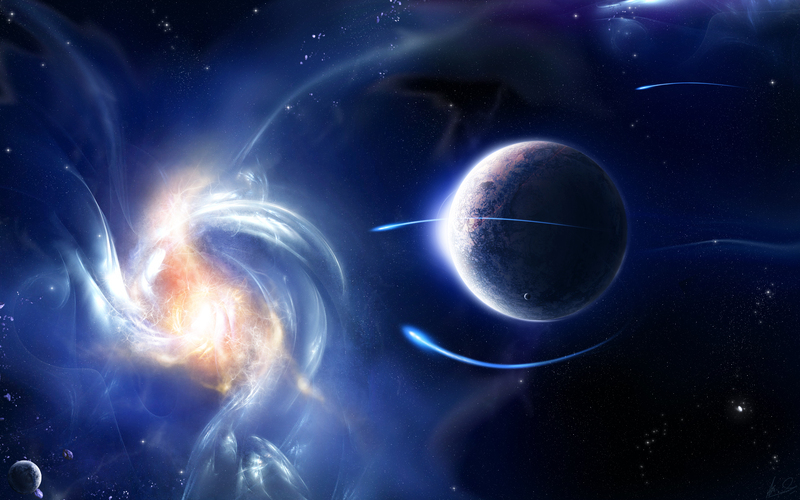 It is very obvious that the universe is very much alive, very much full of energy. However, going to christian story – the world was created in 6 days and God rested on the 7th. God has somehow fitted into our calender. I am sure he never came up with months, days and years when he was creating. So yes, on the 7th day he was resting. Now, as someone with doubts, I would ask what was God doing on the 7th day and thereafter. Has he been continually resting? Has he died? Or has he moved on and created new worlds within new galaxies within the whole, continuously expanding universe? I believe Islam is a little supportive in the theory of evolution as it says Allah had created everything in over 6 long periods. However, even if we take that, religion has taught us one thing and that is to have blind faith completely. Do not question. Do not doubt. Do not expect answers. If you question it then you are anti-god. Why do you want to go in depth for? You do not need to know so much? Why has religion tried to dumb down our intelligence. When we read something, don’t we have a few questions? Where do we search for the answer. I don’t think Dawkins has come across meditation but in meditation we are told to understand the world. Also, there is no satisfaction until we understand the world and the universe that surrounds us. Faith is a funny thing, if you have faith, it does imply uncertainty. The fact is, you cannot see God, he is the invisible man but people continue to pray. They have not understood the vibrations of the Earth but they continue to fall in a trance in temples. Religion has not moved with the times either, as much as the texts may explain a scientific background, the social aspect of religion is very stupid. They want peace but they will hold the sword to your neck and force you to convert. Even though it is not that extreme today, terrorism is still committing to the old times. As much as the Dawkins’ statement is profound to atheists, I am not satisfied with it completely. First of all, religion is a huge concept, it is not just christianity, which I believe is the only religion that Dawkins has truly looked into. You must have knowledge of all religions before you claim that there is no God. It is not necessary to say every religion is bad. They all have their flaws but there are some great things about religion. In fact, Dawkins does not need to look far. Look at the Pagans, they connect with mother nature. Is there any understanding on them? In fact, has Dawkins looked at the two religions that do not believe in a God – Jainism and Buddhism? Religion has faith, which gives hope. The biggest drug in the world is this word ‘hope’. Everybody is hoping that after death that there will be paradise, beautiful angels, virgin angels all in a line waiting for you. Some believe that you simply enter back into existence and it is possible to do that. I can trust you can as an individual, with the aid of meditation – which is tool to connect your mind and body to the soul. You can certainly connect to the universe, to the all-pervading existence eventually with constant meditation. Religion certainly does not allow you to explore your individuality and that is your world. There is no need to connect to the Earth, to the Universe, to even God, all these attempts will be futile, if you cannot explore your inner consciousness – the house of your individuality then what is the point? However, it is religion that has made us realise that we are souls. Individual souls that are on this earth. It is also humans that have tried to connect to the universe, in some form or another. People have described God to be Formless, yet still believe he is a Being. Which in essence, he is still a being if one wants to believe in that. However, I believe that religion has allowed me to explore the Unseen, the One who cannot be given a name, the Unexplainable. The universe seems peaceful, even a black hole that will eventually have some energy fall into it and then no one knows what happens after that. Symbolic Death can be seen similar to that. You enter pure darkness, falling somewhere and then you may be out of the other side. The way humans can see this to support religion is simple. The body is the black hole. On the other-side of the black hole is the Super-Consciousness – what can be called God if it makes you extremely proud of your faith. But what surrounds the black hole is the universe or a solar system which can be termed as our Individual Consciousness. With that Individual Consciousness, when the black hole (the body) detects it, then the consciousness falls into the body and that is where the alchemy is conducted. As the consciousness travels through the body – it then reaches the Super-Consciousness that cannot be comprehended or described into words. It cannot be given a definition. It is within those moments, enlightenment must take place. The Super-Consciousness is the existence that has always existed, that is always creating, that is always expanding. See your Individual Consciousness is within you at all times, and it does seem that it is out of the body but it isn’t. It is within the body but due to our lack of awareness, due to the lack of individuality, it is perceived to be above us, or around us. However, take the body as something that is a vessel. The Consciousness within you will burst out of the body, not literally. It will be very disgusting to see blood and guts everywhere. It will burst out of the body and will connect with the Super-Consciousness. Just see it like wires from one end connecting to the wires on the other end. It is when the Individual Consciousness and the Super-Consciousness becomes one that we attain enlightenment. It is complete awareness. It is complete enjoyment. That is salvation in its true essence. Dawkins is wrong to say religion has taught us to be satisfied with not understanding the world. It is right to say that Dawkins has taught us to be satisfied with atheism with not understanding every religion. In fact, Dawkins’ version of Atheism is very narrow-minded. It is just as worse as the Bible, that he always criticises. I don’t believe in a God, I know God does not exist. The followers of religion and spirituality may not be happy with my statement. The once close friends or the close friends I have may not be impressed with my exploration. But I have gone to the hidden depths of the Formlessness of the so-called God. I cannot give it a name as it is Formless. How can you name something that is Formless? Even calling it Formless is a straight cut contradiction. I have gone down to the simple basics. God does not exist but Super-Consciousness does exist. It’s the Super-Consciousness that unravels the secret of the Universe. The secret is so simple that it shouldn’t have become a secret. However, religion/spirituality has really dumbed down a very simple secret. They have dumbed it down into complication. They have took the holiness out of the secret with their jargon and beautiful verses. Their own myths and legends have overshadowed the simple secret. Religion is simply digging it’s own grave. All we needs is awareness of our individual consciousness and the secret will slowly unravel by itself.